Ohio Auditor of State's office works to ensure that the Ohio Sunshine Laws are respected and enforced at every level. The Ohio Open Meetings Act requires public officials to deliberate, discuss and conduct the people’s business in open meetings. This means that if a public body is meeting to discuss and decide public business, the meeting must be open. Ohio Sunshine Laws ensure all citizens are granted the right to have broad access to government records and meetings. The Ohio Public Records Act provides the public with procedures to request records from any public office in Ohio, while protecting certain types of records from release. It also establishes a legal process to enforce compliance when a requester feels that a public office has failed to satisfy its public records obligations. The Public Records Act ensures that public documents belong to the people, not to the government body holding them. The Open Government Unit educates the public and government about the intricacies of Ohio’s Sunshine Laws. This is accomplished by providing resources and trainings to the public and government officials. The Open Government Unit offers Certified Public Records Trainings, which are required for all elected officials. These trainings also provide private citizens the opportunity to learn more about their rights and the obligations of public offices to maintain open government. 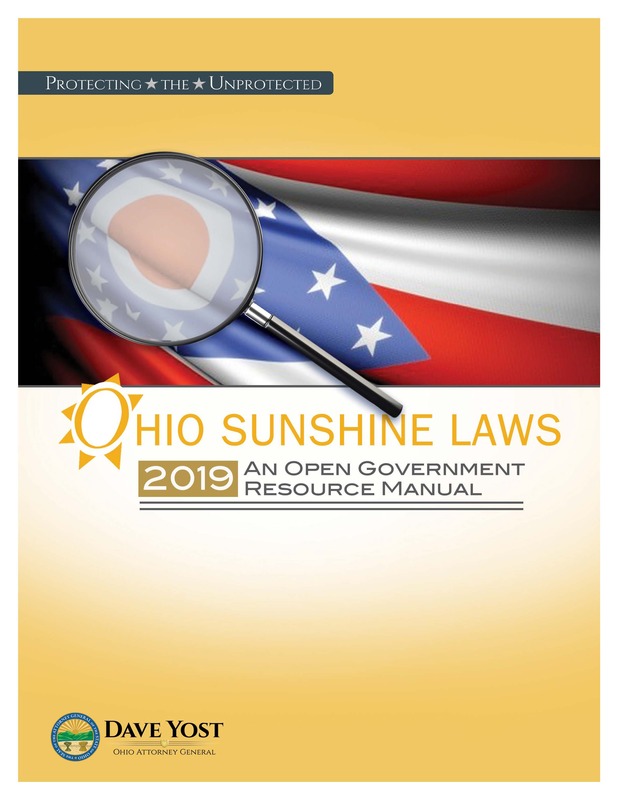 Each year, in partnership with the Ohio Attorney General, the Auditor of State publishes Ohio Sunshine Laws, An Open Government Resource Manual. This book provides extensive information regarding the Ohio Public Records Act and Ohio Open Meetings Act.